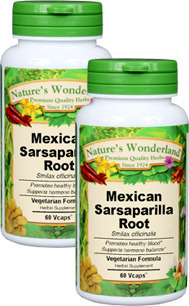 Sarsaparilla, Mexican Capsules - 575 mg, 60 Vcaps™ each (Smilax Officinalis) - Penn Herb Co. Ltd.
Sarsaparilla is perhaps best known for giving root beer its distinctive taste. Today though, the aromatic root is often used as a traditional blood purifier that promotes healthy skin, and as a main ingredient in male & female hormone balancing formulas. Sarsaparilla is native to the Caribbean and other tropical regions, where it’s popularly used in sexual performance blends, joint care formulas, as well as external & internal skin care preparations. Find this rejuvenative root in our best-selling Nature’s Wonderland formulas: Glands Support, Blood Purifying Formula, Adren-Aid, Hormone Regulator, and the popular Catfish Bitters Tonic. ALSO KNOWN AS: Jupicanga, Khao Yen, Smilax, Zarzaparilla. Traditional blood purifier; supports healthy liver function; promotes healthy skin; promotes hormonal balance; supports glandular health - provides adrenal support; gentle diuretic; performance tonic; promotes joint comfort. SF032409 Sarsparilla Root Smilax spp. SB042408 Sarsparilla Root Smilax spp. SB070207 Sarsparilla Root Smilax spp. HB100605 Sarsparilla Root Smilax spp. WH052505 Sarsparilla Root Smilax spp. WH031204 Sarsparilla Root Smilax spp. WH060597 Sarsparilla Root Smilax spp. WH030697 Sarsparilla Root Smilax spp. HB100296 Sarsparilla Root Smilax spp. HB092396 Sarsparilla Root Smilax spp. HB032893 Sarsparilla Root Smilax spp. HB050395 Sarsparilla Root Smilax spp.